Sophie Simon isn't like most eight-year olds. Instead of eating cupcakes at birthday parties and having playdates with her friends, she'd rather be reading college textbooks on calculus and psychology. Who has the time or the inclination for friends? Her parents, however, would much prefer to have a normal, "well-adjusted" child and worry about her strange hobbies. So despite Sophie's pestering, they refuse to purchase the Pembo Q-60 calculator for her that she's been pining away for. So in order for Sophie to get the calculator she so desires, she finds herself having to *gasp* help some of her classmates and, heaven forbid, behave like a friend to them. Will Sophie just use her classmates to get what she wants, or will she eventually learn the true value of friendship? 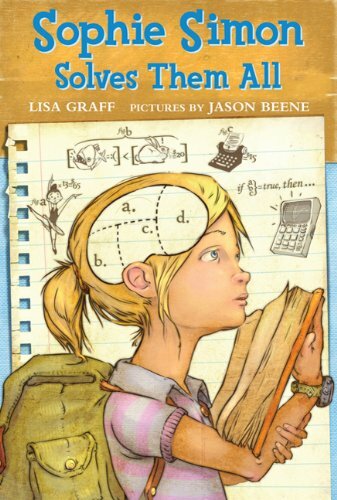 Find out in this charming book by Lisa Graff, author of Umbrella Summer. Stop by on Friday, October 8th for an interview with the author and a chance to win a copy of Sohpie Simon Solves Them All. This looks so cute! It's definitely on my to-read list now.